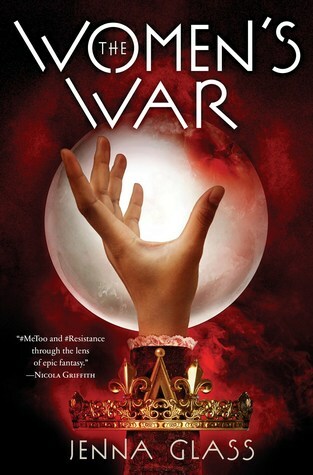 The Women’s War by Jenna Glass is the first book in the epic fantasy Women’s War series. This is another book in which women have been treated as if they are property instead of equals along the lines of things like The Handmaid’s Tale or Vox. In here though we start off meeting Alys who is the daughter of a King but her mother was exiled years before when the King decided he was finished with her so Alys has been disinherited. While visiting her mother in the awful place she had been living since her divorce Alys’ mother hints to something big coming for women and later that night she does cast a spell that releases the women of the land. From that point of the spell taking place the book begins to switch the point of view between differing areas of the two kingdoms involved. Alys finds herself looking for answers to help her daughter, Ellis finds herself in line for the throne of her kingdom without a husband and then there’s the place in which Aly’s mother had been with those woman finding are not what they would seem. I’m not sure I would even need to say to those that know me well that over five hundred pages of book I did find some places that really seemed to slow down and be in danger of losing my attention. I did like the idea overall of the world the author tried to create here and to be rather vague this was due to following the different classes and getting a point of view from all angles. Some of the content could be a brutal and might bother some but it wasn’t as bad as one could expect either, if that makes sense? So while I wasn’t completely wowed at the end I did enjoy this one and would give it 3.5 stars.